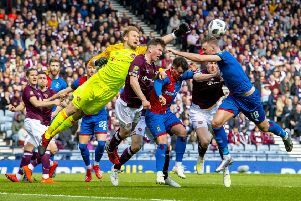 For Bobby Burns, Saturday’s victory over Inverness Caledonian Thistle wasn’t just about helping Hearts reach a Scottish Cup final. It was also a chance to put a smile on the face of his doting mother as she travelled to Scotland to watch her teenage son play for Hearts in the biggest game of his young life, despite being plagued by health problems for much of the past year. “My mum was pretty sick last summer with heart problems so it was hard for me to settle at first,” said Burns, pictured below, who joined Hearts last July. “I was saying to her to be careful because she gets very into the football matches, screaming and taking photos so I told her to calm down. She’s fine though. She had pacemaker wires in the summer. They take them out and put new ones in. She’s keeping much better now, she’s healthy thank God. “Myself and my brother were getting more into religion, just praying and letting God control whatever happens with her health and our family. Burns, from Crumlin in Northern Ireland, is indebted to his parents for the part they played in allowing him to forge a football career. His father and his brothers are set to head over to Hampden for the final against Celtic next month. “They were a terrific influence of me,” said the 19-year-old. “That’s why I would love to give something back to them. After joining Hearts last summer and playing a part in their Betfred Cup group matches and the league opener at Hamilton, Burns was then loaned to Livingston for most of the first half of the season. He has had to bide his time to start making headway at Tynecastle but long-term injuries to Demetri Mitchell and Ben Garuccio have paved the way for him to take control of the left-back position. After making his first appearance for Hearts since returning from Livingston in January as a substitute away to Rangers a fortnight ago, he was a surprise starter against Hibs a week past Saturday and then retained his place on Saturday. “This time last year I was finishing school. It is an unbelievable turnaround,” he said, reflecting on his new-found status as a starter in a Hearts team gunning for glory. “It has been an up-and-down season, going on loan and having some good results for the Northern Ireland Under-21s against Spain and Mexico. “There have been downs as well with injury and my mum’s health so you have to enjoy the good times while they last. If I could win the Scottish Cup final it would be a dream end to my first season in Scottish football.